We specialise in colour managed, large format giclee printing. 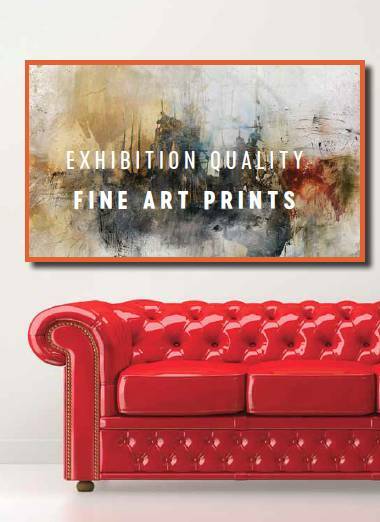 Using both an archival high grade ink set and a hand selection of fine art media, we produce premium prints for exhibitions, galleries and artists. GALERIE Prestige Fine Art Smooth has a matt warmtone surface. Created from an alpha-cellulose base with the latest advances in matt coating layer technology, this new product allows professional and enthusiast fine art photographers and printers to achieve the artistic interpretation of an image by drawing out sharp crisp details, while maintaining vivid colours. The new GALERIE Prestige 100% Cotton fourdriner-made rag papers lead the way within the range in meeting the needs of professional fine art printers. Photographers and print-makers alike can rely on these new papers to produce the highest quality images they have come to know and love from ILFORD. With no optical brighteners and the longevity, image stability and a clean matt surface required for the very best in fine art printing, Fine Art Smooth is offered as the perfect choice for crisp detail, while the Textured Cotton features a contoured surface for enhanced creative expression.